Who wanted to see Jesus? Who tried to stop the children from seeing Jesus? Why do you think the men didn't want the children to see Jesus? Why did Jesus want to see the children? Verse: Matthew 19:14- Let the little children come to me. Name: Write the 1st letter of your child's last name using 3" Letters. - Paint the Jesus and the Little Children worksheet with a mixture of corn syrup (very little needed), water, and food coloring. While singing "Jesus Loves the Little Ones Like Me," place a mirror in front of a different child's face each time you sing the word "me." This activity is especially fun with a large group of children. - Introduce the letters Vv using the tactile letters and decorate the Letter Poster to add to the Letter of the Week book. 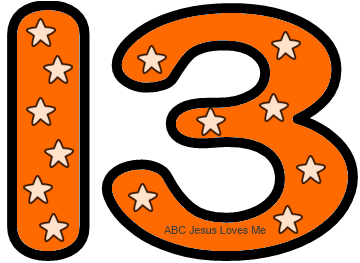 - This week draw lines on the Number 13 Poster and then color in an AB pattern. Add thirteen stickers. If the child is ready, introduce the first letter of her last name. As with the first name letters, instruct the child to trace the tactile letter. If she is able to correctly form the letter, give the child the 3" Letter cut from the 3" Uppercase Letters worksheet and placed in a dry erase pocket. With a dry erase marker, demonstrate how to form the letter while saying the Letter Formation Chant. Then, allow the child to write the letter and use the green and red dots as reminders. 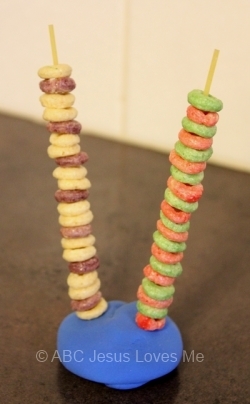 - Hide two different colored beads in play dough or putty and have the child find. Encourage your child to not use her thumb but to use the weaker fingers instead. Create an AB patterns with the found beads. Using the book From Head to Toe, walk like an animal. Have the kids come up with ideas but here are a few to get you started.